Description You'll zip through a big family ironing in record time with the new Kenmore Automatic Ironer. Illustrated booklet shows how to iron... press... steam. Features two roll speeds--fast for flat work and slow for fancy ruffles and frills. Both shoe and press control helps to free hands for guiding work. Exclusive adjustable light for best work area illumination. New, large drop-leaf, lap shelf. Easily accessible release bar. White baked-on enamel finish. Hinged cover and chrome hardware. Description You can roast a turkey and all the trimmings, broil other meats and vegetables, fry apple rings on the griddle--all this at the same time! 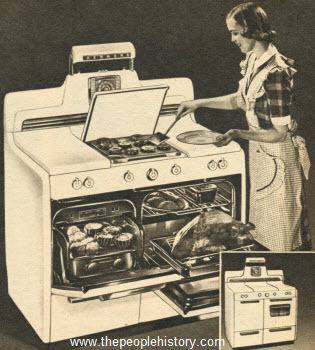 Smokeless waist-high broiler is oven-size. Chrome-plated broiler rack adjusts easily to desired height. Oven has deep Roast-R-Pan and trivet. Visi-bake oven door lets you have the fun of seeing what's cooking; peek-switch turns on oven light. 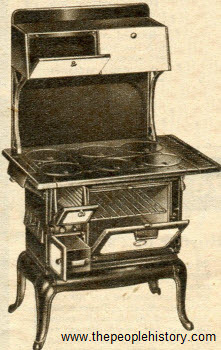 Three giant, two standard top burners, and two Warm-R-Burners. Cooktop covers with baking charts inside. Two utility drawers. Description A brand new Kenmore development with unexcelled toasting performance. Perfect toast every time, whether you make just one slice or two. And the exact browning you select--light, golden or dark brown. Every slice alike... no progressive darkening. New quiet cushioned pop-up, too! Toast pops up high for easy reach. Even small slices can be removed without burning fingers. No ticking... it's silent. Should you forget to set browning control (or if you're in doubt) just flip the inspection knob... toast pops up for a quick look. 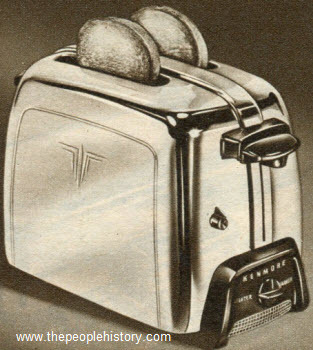 To continue toasting, push lever down. Fine for dry or raisin bread. Mirror-finish chrome-plated. Hinged crumb tray. Brown plastic handles. Description Cabinet beauty! Matched five-ply mahogany veneers... carefully hand polished. 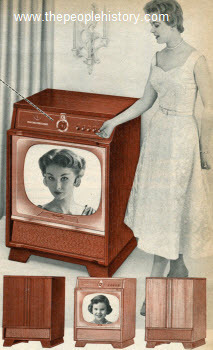 Television superiority. Powerful chassis gives best fringe area reception. Deep-voiced sound. Exciting new bass compensation... variable tone control. Magnificent "Photo-Tune" pictures in a twenty-inch rectangular black tube! 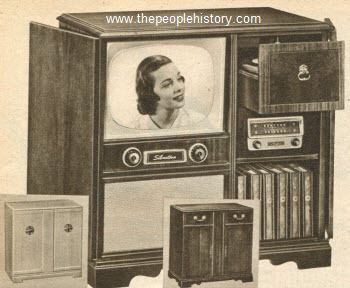 Brings all the magic of no glare television into your living room. Perfect viewing from almost any angle... annoying reflections eliminated. Has twenty-three tubes plus two rectifiers and picture tube. Marvel at the easy two-knob tuning. 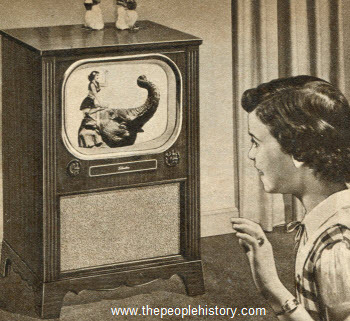 Just select your channel, get your picture, and sit back to enjoy the finest programs on television. Description Completely new and fully automatic. Defrosts exactly when needed... no clocks, no exposed heaters. Safer, more uniform cold in huge freezer chest. Frozen foods won't thaw out, even during defrosting. Electrically warmed thermostat-controlled butter-ready. Dial consistency you want. Separate dish lifts out for table use. Rustproof structural aluminum shelving--a Coldspot exclusive. Easier to keep sparkling clean, adjustable, too. Automobile type door lock. Set of two keys furnished at no extra charge. Color-tone interior beauty... gleaming white porcelain enamel with colorful harmonizing trim. Description Dump your food scraps, sweeper dirt and rubbish--anything burnable--into this Kenmore garbage burner... light it and leave. No more trash-burning sessions outdoors... no more bother with garbage cans. Heavy-gauge steel body has smooth, metallic brown baked-on enamel finish. Top, grate, burner are sturdy, warp-resistant cast iron. 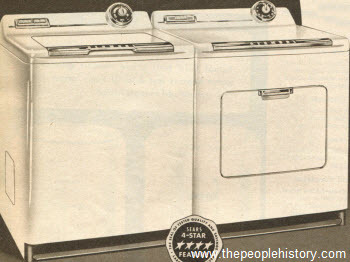 Description The best automatic washer and dryer set. 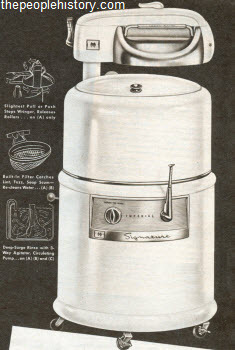 Washer has exclusive roto-swirl agitator, nine pound wash capacity, visi-dial washing control, push-button water temperature control, push-button water level selector, suds-saver, sun-fresh germicidal lamp, rustproof porcelain enamel top, tub interior light, automatic self-leveling legs, convenient top loading and easy installation. 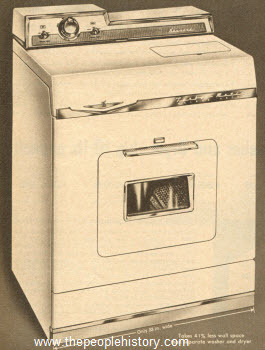 Dryer has fluff-dry or damp-dry nine pound loads, illuminated visi-dial drying control, push-button-select drying temperature, sun-fresh sanitizing clothes lamp, load-a-door sorting shelf, rustproof porcelain enamel top, convenient interior light, automatic door shutoff, convection type heating, power-driven ventilation system, automatic safety thermostats and correct temperature for any fabric. Description Truly an ideal gift the whole family will enjoy for years. The best Silvertone twenty-one inch S.R.O. 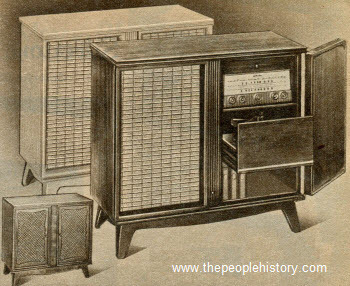 TV with long-distance AM/FM radio and three-speed automatic phonograph in a massive, modern cabinet. All-Channel TV chassis tunes any of the twelve VHF and seventy UHF stations in your area. No converters or adaptors needed. Modern design hardwood veneer cabinet is hand rubbed and comes in mahogany or limed oak veneer. Description White parts are porcelain enameled. Balance plain black finish. Side pouch feed for coal. Burn soft coal or wood that is eighteen inches long. Polished six lid cooktop. Oven heat indicator. High closest model. Description Cleaner has extra powerful 1HP max motor that pulls embedded dirt, dust and lint right out of carpets. Quiet motor is rubber mounted. Ball bearings with sealed-in lubrication assure extra long life. Cleaner empties in seconds with throwaway paper dust bag--your hands never touch dirt. Cloth filter bag. Use for suction or blowing. Tip toe switch. Rolls easy from room to room and the complete set of attachments travels with you. 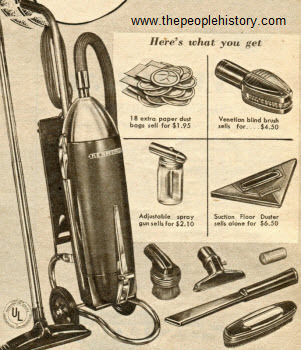 Nine floor-to-ceiling attachments including: eight foot hose, two wands, floor nozzle, wall and floor brush, dusting brush upholstery nozzle crevice tool, demoth cartridge, twelve dust bags, suction floor duster, adjustable spray gun, Venetian blind brush and eighteen extra paper dust bags. 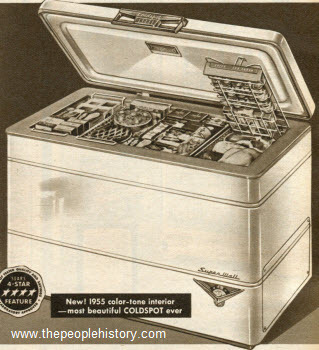 Description The largest Coldspot freezer, twenty cubic feet with a seven-hundred pound food capacity. 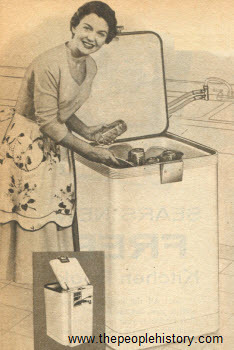 Freezes and stores up to 350 meals and has eleven convenient food storage sections. Costs only $20.48 per cubic foot. 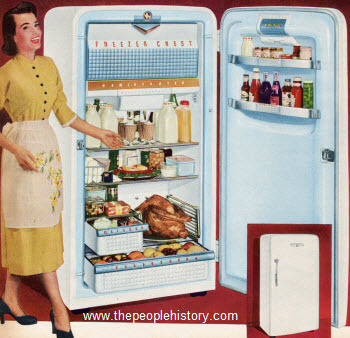 This freezer is especially recommended for large families or for farm or suburban use. Quick-freeze compartment, three food elevator baskets, two storage baskets and adjustable basket. Ready rack stores juices, ice cream and small items. Description High definition picture. Twenty-five percent bigger than expanded twenty-one inch. Exceptional edge-to-edge focus means razor-sharp detail all over the screen. Aluminized screen with tinted safety glass provides a bright picture. The high-fidelity FM sound system has three speakers that distribute sound evenly around the room for amazing depth and liveness. Has plenty of reserve power for adverse fringe area conditions. Cascode tuner provides tremendous sensitivity with minimum noise and "snow". Deluxe "showpiece" cabinets. Choose from mahogany, blonde or limed oak veneer. Description One of the newest and brightest ideas in mixer styling ever--kitchen matching colors. 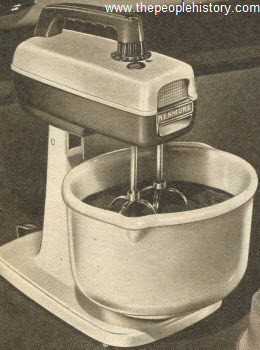 Mixer has 150 watts power, choice of twelve speeds, a host of work-saving features and a choice of four colors: medium gray and white, yellow and white, pink and white or green and white. Slide-out guide shows correct mixing speed for every mixing job. Thumb-control speed dial gives handy, one-hand speed change. Two big chrome beaters draw all the batter through the blades while the bowl revolves at a constant, controlled speed. Instant beater ejection. 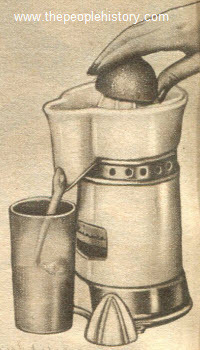 Comes with two white glass bowls (one and three quart), each with pouring spout and handle. 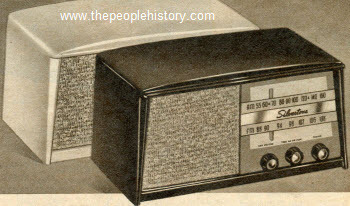 Description More sensitive, more highly styled than any other AM-FM table radio that's been sold. Features the dual-cone speaker, AM-FM tuner and the spot light dials that pinpoint your station.. separate light for each band. Tuned RF stage acts as built-in booster for weak FM signals. Built-in antennas for AM and FM. You'll enjoy FM radio for it rejects static and provides the proper contrast between loud and soft musical passages. Use outdoor turnstile FM antenna for best results in FM fringe areas. AM-FM take-off jack provided in rear for use with external amplifier system. Six-inch dual-cone speaker produced rich full tone and ample volume. 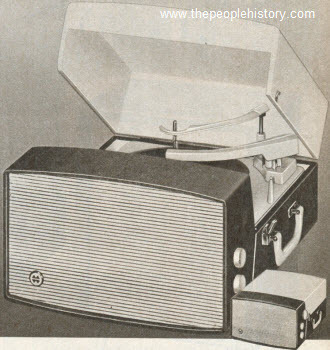 Equipped with tone control and phonograph input jack. Super powered chassis. Iron core coils minimize warm-up drift. Seven powerful tubes plus rectifier. Gleaming plastic cabinet in modern design. Comes in brown or ivory. Description She'll adore the man who chooses this precision engineered, all new Kenmore Automatic Electric Can Opener for her gift. Opens round or oval-shaped cans in a wink! Faster, better, easier, safer... never leaves dangerous ragged edge. So easy to use... so safe that even a child can operate it. No more struggling and cranking... just place the can in position, depress the control handle. 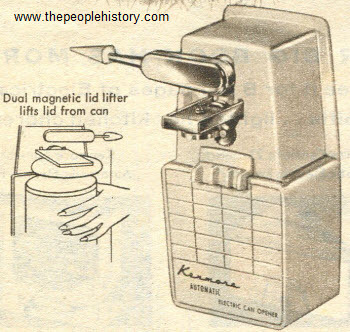 The dual magnetic lid lifter picks the lid from the can as it is opened. Made of high-impact, two-tone beige-color plastic to match or contrast with kitchen decor. Chrome-plated handle, cutter and drive gear. Description No better way to start the day! Every morning of the year will be brighter with eye-opening juices prepared by this new juicer. Oranges, lemons, limes or grapefruit become delicious, healthful taste treats at the flick of a switch. Juicer has fan cooled motor, "on-off" switch. White enameled body and chrome plated top and base. Comes with white glass bowl, two juice reamers and juice guide. Description You'll be amazed at how much better your old records sound--how realistic the new hi-fi recordings are. Three speakers--one fifteen inch woofer and two special five inch tweeters. The sound is diffused evenly for exact tonal balance. Connections for additional external speakers plus provisions on back for use with separate auxiliary speaker amplifier for more flexible control of added external speakers. Also connections for use with external tape recorder. You can record from radio or records and play back through set. Comes in mahogany, limed oak or maple veneer. Description Plum-red and white case. Sensitive AM radio pulls in distant stations. Four tubes plus rectifier chassis. Built-in antenna. Speakers; one six inch woofer for low notes and one three inch tweeter for highs. Has deluxe four speed changer that plays all size records. Changer shuts itself off after last record plays. Ceramic turnover cartridge with two sapphire needles for regular microgroove records. Description Most nearly automatic wringer-washer ever made! Has the safest instant-stop wringer that guards against accident and has deep-surge agitated power rinse and built-in lint filter. 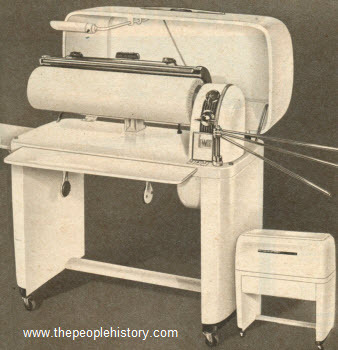 Has an eight-position automatic wringer stop with no lever to release. Automatic timer shuts off washer and rings a reminder bell. 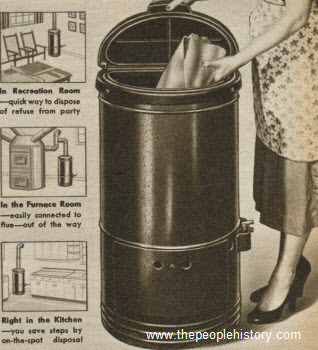 Capacity to wash ten pounds of clothing at once. Washer tub is porcelain enameled inside and out and has chromed drain boards and controls. Description Mounted on outside walls where heat is most needed.. they provide "perimeter" type radiant and circulating heat. Several heaters located strategically throughout your home provide zone controlled heat available only in central-type heating systems. Models are thermostat equipped and automatically adjust to proved controlled heat for each zone. Models have automatic safety pilot which shuts off the gas if the pilot light should go out. No flue pipe needed except the EZ vent. Blonde-beige on baked enamel finish steel cabinets are handsome enough for any home. Expanded metal front and louvers at bottom allow comfortable warmth to circulate... eliminate cold, drafty floors. Description Attractive new design, color trim, improved construction. 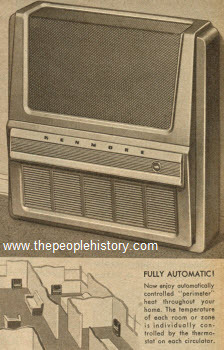 The new Kenmore is better-looking, better built than ever. No installation cost... just attach hose to hot water faucet, plug cord into outlet, and turn on the dishwasher. Service for eight people is washed, twice rinsed and dried by 800-watt heating coil. New controlled venting improves drying. Lower rack has twenty spaces for various sized dishes; upper rack will hold as many as twenty-four glasses and eight saucers. Silverware basket holds up to forty-eight pieces. You can take washer with you when you move... rolls on easy-glide concealed casters. New spring-operated lid eliminates awkward-support arm new rub and lid gaskets give positive water seal, new positive-closing latch design. Quiet and economical to operate. Description Never before was washday such a day of leisure. Exciting new Kenmore Turbo-matic literally does everything for you... washes, rinses, dries and shuts off... in one continuous operation... without watching. Once you've tossed in soiled clothes, set the time and temperature dials, your work is finished. Take them out at your leisure... clean, completely dried, and "sun-freshed"... ready to iron, or fold and put away. Your hands never touch water, never come in contact with bleaches or detergents. Wash at any time of the day, up to ten pounds of clothes.